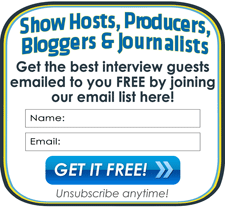 Interview Guests Directory - Find Guests for Podcasts, Radio, Articles, PR, and Press Interviews - Featured Guest Star Listings for Maximum Publicity! Featured Guest Star Listings for Maximum Publicity! Being "Featured" on our popular home page is a great way to attract publicity and interviews! Our "Featured" Guest Stars get exclusive home page exposure on our site. This showcases their expertise and talent to our worldwide audience of journalists, radio show producers, talk show hosts, bloggers, and more. If you're ready to turbo-charge your publicity efforts, upgrade your guest expert profile listing to become a Featured Guest Star today! As you can see, there is a limited number of these high-profile publicity placements available on our Home Page. Placement is first come, first-served, so we recommend upgrading today to take one for yourself before they fill up! How much does being "Featured" cost? You can list as a Featured Guest Star for only $28/month! Terms: This publicity upgrade is an additional charge to a pre-existing Guest Expert profile, so it requires an active Guest Expert profile subscription. You can cancel the upgrade any time separately from the underlying Guest Expert profile. To cancel the recurring charge and have your listing removed, simply visit your Paypal account to cancel there. We will be notified and will then remove your listing from the home page. No partial month credits. Subscription rates are only good until cancelled. Cancellation (or credit card troubles like expiration or card replacement) will lead to removal from the site. Reinstatement will be at then prevailing rates. Pricing and service details are subject to change. This special introductory price is certain to climb, so if you are interested, please sign up now to lock-in this low rate for home page placement. Also, once you are a "Featured" Guest Star, you can take advantage of our Special Edition email blasts. For only $169 we will create a solo email blast of your Featured Guest Star listing for exclusive email broadcast to our email list. These stand-alone Special Edition emails always bring great results to our Featured Guest Stars who are looking for more publicity and interviews. If you are interested, get more details here.